By buying this product you can collect up to 359 points . Your cart will total 359 points that can be converted into a voucher of ₱359 . The Acer Swift 3 was named so for good reasons: its super-fast! It’s super-thin! And it’s super-light, too, so you can swiftly transport it and power it up anywhere life takes you! Built for productivity on the go, the Swift 3 leverages powerful processing and the fastest wireless connection. Combine that with its 14” FHD IPS display, stylish aluminum chassis and an extra-long battery life, and you quickly see why this PC delivers a most memorable multimedia experience. 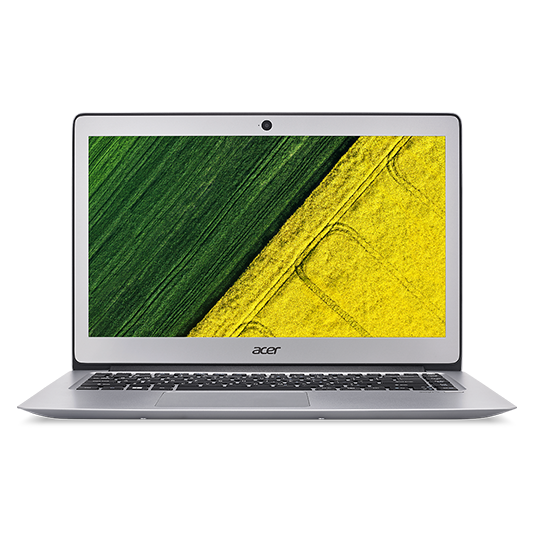 The Acer Swift 3 stylishly slender all-aluminum body is cool to the touch and gives this laptop a touch of personality. At only .71-inches thin, it’s one of the thinnest 14" notebooks in its class making it super easy to bring with you on the go. Inside, powerful processing and the latest hardware ensure you have the performance to get what you need done. Stylish design, immersive display and amazing battery life make the Swift 3 stand out from other products in the market. The all-metal chassis with symmetric, perfect rounded-corners and classic finish give this notebook a calm, friendly, and firm impression. 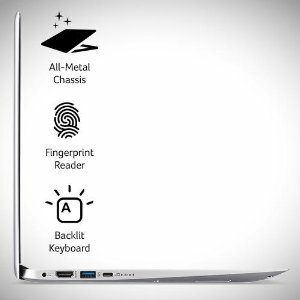 An embedded fingerprint reader provides an extra level of biometric security safeguarding unauthorized users from accessing your PC. The reader works with Windows Hello, verifying your fingerprint in seconds and automatically logging you into your Windows account. The backlit keyboard completes the modern look and feel. Its spacious keys let you type up a storm anytime and anywhere, even when it’s dark. The large Precision Touchpad provides a smooth touch experience and accurately senses the fingertip movements. The touchpad fully supports the new Windows 10 features: Cortana, Multitasking and Action Center allowing you to do more with the touch of your fingers. Watch what you love in all its clarity and from wide-viewing angles with a 14" Full HD IPS display. Acer Color Intelligence dynamically adjusts gamma and saturation in real-time, optimizes screen color, brightness and saturation without clipping and oversaturation. From bedtime storytelling to watching a movie, you’ll experience a consistent color and viewing experience from any perspective. Spending a lot of time on your PC? Turn on Acer BluelightShield feature and reduce blue-light emissions from the screen, reducing eye strain and preventing fatigue when using your PC for extended periods of time. Acer TrueHarmony speakers deliver more accurate sound reproduction and fuller-bodied audio that takes entertainment to the next level. The one-of-a-kind speaker design fine-tunes and improves the frequency balance to deepen the impact of movies, games and music with improved bass and multidimensional sound. Certified for Skype for Business means the microphone, speakers and HD Webcam are guaranteed to work perfectly with Skype for Business. Web chat, video conference and share files seamlessly with superior audio and crystal clear visuals. Stay productive and connected, wherever the journey may take you. With up to 10-hours of battery life, the Swift 3 can stay unplugged on a flight from Dubai to Hong Kong, and then some. Accomplish all your tasks from day to night without fretting if there is no power outlet in sight. 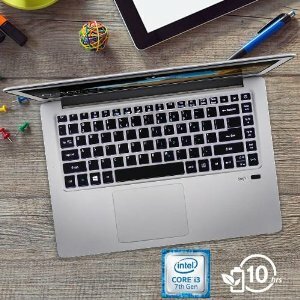 Powered with a 7th Gen Intel Core i3 processor, enjoy premium performance that goes where you go. 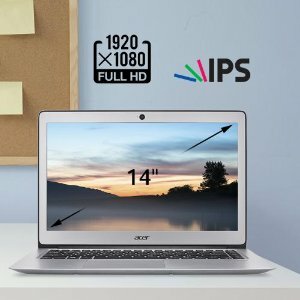 Effortlessly move between multiple apps and enjoy blazing-fast responsiveness, high-speed connectivity, smooth streaming HD video, and amazing graphics and gaming, anytime and anywhere. The Swift 3 Notebook brings speed to another level. Equipped with the latest 2x2 802.11ac MU-MIMO technology, enjoy up to 3 times faster wireless performance than before. Stream, download and share to your heart’s content.